Izentis is a world leader in beamed energy propulsion technology. Our team has experience in both the theoretical and experimental aspects of the technology. This includes publishing papers on heat exchanger technology and building test rocket vehicles. 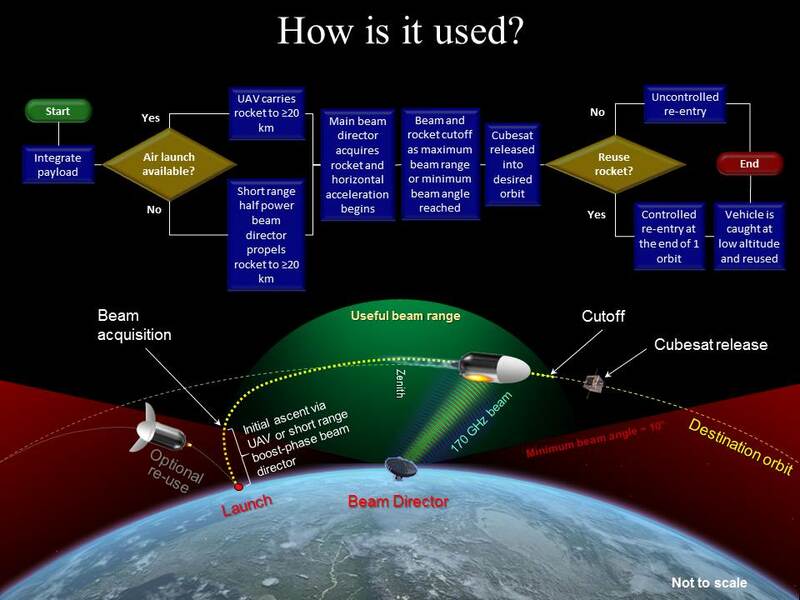 The concept of beamed energy propulsion is to use an external energy source such as a ground-based laser or microwave to power a rocket. This removes the energy limitation of chemical rockets allowing for both high thrust and high specific impulse. Such technology could allow for single-stage-to-orbit launch vehicles with significant structural margins, enabling “jetliner-like” re-usability. A fully re-usable launch vehicle could yield launch costs well below $100/pound, which will radically change access to space. The cost to low-earth orbit is the dominant driver in the high costs of space missions, and reducing this cost by orders of magnitude will be a game changer for all space missions. In order to orbit the earth at an altitude of approximately 100 km an object needs have a velocity of 7.8 km/s. This neglects losses such as vertical motion to get to space, gravity, air drag etc. 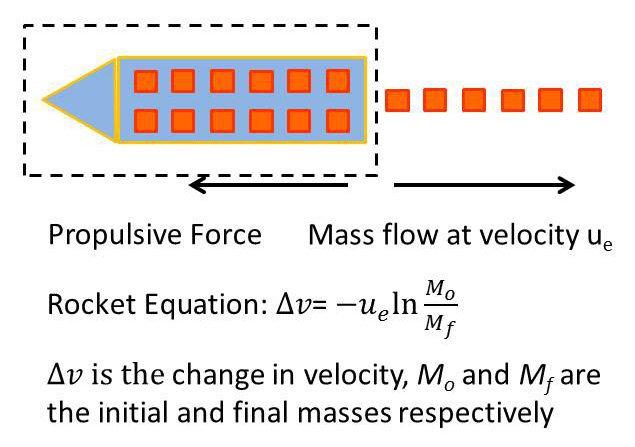 The real change in velocity a propulsion system must deliver is around 10 km/s. At present, rockets are the only proven safe way to accelerate an object to 10 km/s. They work by momentum transfer; gas is accelerated and expelled from the rocket causing a force in the opposite direction. Rockets currently come is two flavors, chemical and electric. Chemical rockets burn chemicals to generate a hot gas which is accelerated through a nozzle via pressure forces. Electric rockets accelerate ionized gases or ionic liquids via electrical forces. Chemical rockets are used to launch from the ground to orbit since they can provide high thrust and energies. Chemical fuels have energy densities of ∼10,000 kJ/kg, which enables them to produce the mega to gigawatts of power necessary to launch payloads to orbit. Unfortunately the exhaust velocities are limited to ∼4,500 m/s. This means that single-stage rockets are approximately 90% fuel, which results in very low structural margins. The cost of fuel is actually fairly low, and some chemical fuels are ∼$0.1/kg. The main issue is the low structural margins lead to expendable rockets, or rockets that require many months of refurbishment between flights. Airliners are inexpensive because they have sufficient structural margins to enable quick turn-around between flights, and rockets currently need to be replaced or taken apart. The result is launch costs between $2,000-10,000/lb which precludes many ambitious space endeavors. Electric rockets can accelerate ions to ∼100,000 m/s; however, they require power supplies which weigh ∼10 kg/kW, which is several orders of magnitude too high for producing the megawatts necessary for launch. Electric rockets are extremely useful in space where low thrust and powers are sufficient. The idea behind beamed energy propulsion is try to combine the best of chemical and electric rockets. By beaming the energy from the ground to the rocket, the power supply mass is irrelevant, and there is practically no theoretical limit on how much energy can be beamed to the rocket. It may be possible to heat a propellant to extreme temperatures or ionize it and accelerate it to 10,000-100,000 m/s enabling much higher structural margins and airliner-like re-usability. That is the goal or beamed energy propulsion and an active area of research by Izentis. Izentis was a contractor for the Millimeter-Wave Thermal Launch System (MTLS) program funded by NASA Ames and DARPA. This technology is similar to the Microwave Thermal Thruster proposed by Dr. Kevin Parkin. The idea is to use millimeter waves to heat a working fluid via an alumina or silicon carbide heat exchanger. Alumina and silicon carbide channels will strongly absorb millimeter waves with the right dopants and wall thicknesses. A fluid is then passed through the channels and convectively heated, and then expanded out a nozzle like a chemical rocket. The propellant can be chosen almost arbitrarily, which is an advantage of this approach. Hydrogen can be used, which has a specific heat capacity 5 to 10 times that of the product gases from typical chemical rockets. 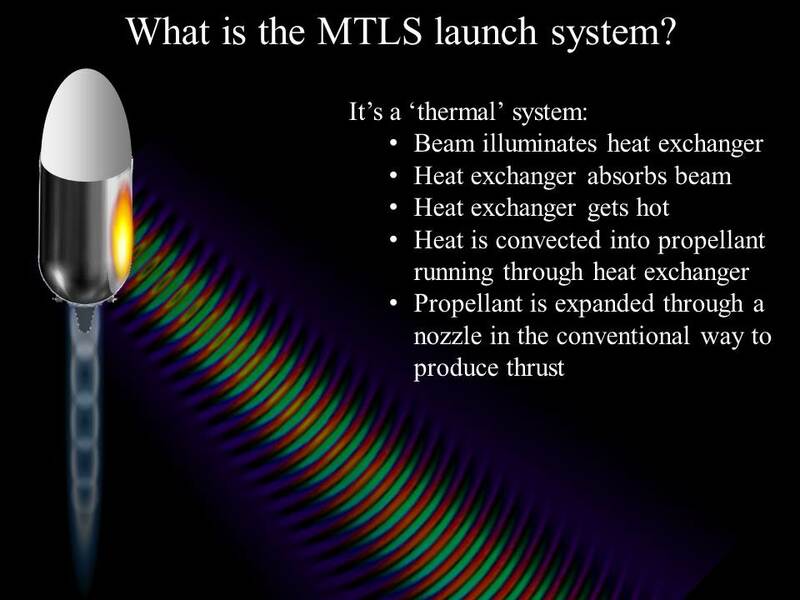 This could lead to exhaust velocities in excess of 8,000 m/s for temperatures around 2,500 K.
The MTLS program was aimed at demonstrating the technology and it was broken down into two phases. The first was to test materials and coatings for the heat exchanger with a high-power gyrotron. The second phase was to use a 100 kW class W-band source to power a small test vehicle. 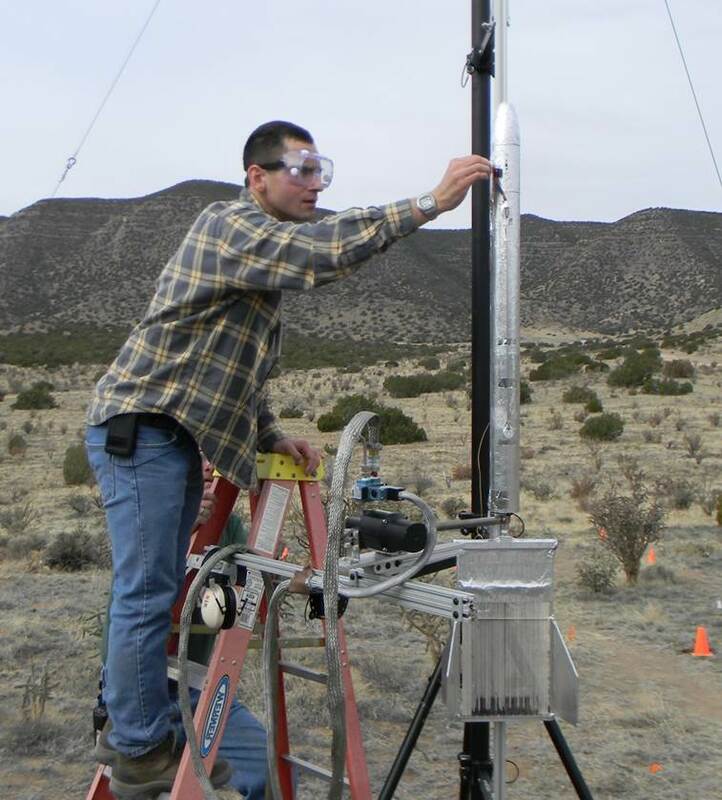 The goal was to demonstrate a complete launch of a millimeter-wave powered rocket. Izentis entered the project to consult on phase 1 of the project, and then was contracted to build the test vehicles for phase 2. This included designing and building the high-pressure fluid systems, aerostructure, recovery system and radiation protection system. Izentis integrated the vehicles with the heat exchangers, and took part in the test flight campaigns. The high-pressure fluid systems were operated at 3,000 psi and met NASA safety standards for human handling. The program ended with the successful launch of a test vehicle demonstrating the feasibility of beamed energy propulsion via millimeter waves and heat exchangers. See the media page for a video of the flight and contact us for more information. A short technical manuscript was written on the side-engaged MTLS vehicle. A copy of the paper can be downloaded below.